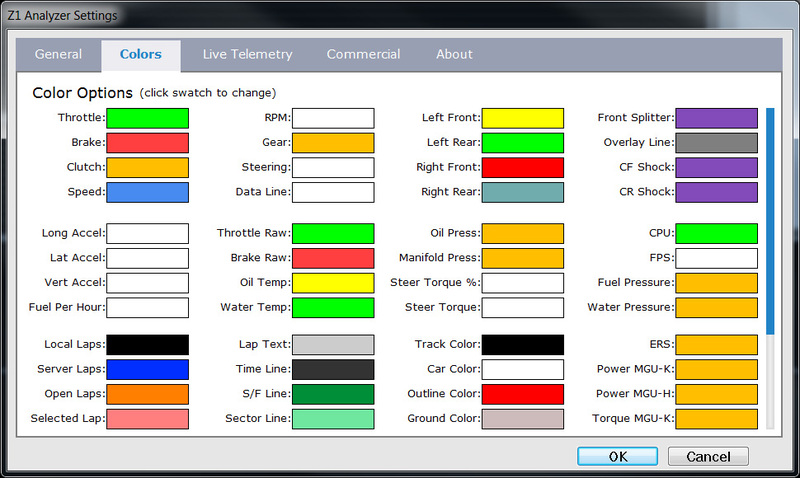 The Z1 Analyzer software allows you to easily customize the colors to suit your style. This customization is done using the Settings Dialog, accessible by clicking the Settings Icon at the top left of the screen. The settings dialog contains multiple tabs with specific settings under each one. This page describes the Colors settings tab. Each of the traces used in the Analyzer can have its own color. In addition the overlay line and data line also have colors assigned to them. This screen allows you to customize the colors used in each of those to your own preferences. Just click on the swatch you want to change and then use the color picker to select the desired color. When you are done click OK to save your changes, or cancel to discard them.